Plans that look great on paper don't always work out as spectacularly as they should. We had decided to forego regularly scheduled break weeks because we often take off days for field trips and doctors' appointments. We also take one day a month for an Amber and Mom day. Our break weeks felt redundant and often we couldn't wait for them to be over. Our grand plan for this year was to simply communicate when we were getting tired and take a day or two or three off when needed. So this week would have been our first scheduled break week had we stuck to our five weeks on / one week off schedule. Instead we had planned to continue regular school on Tuesday after the Labor Day holiday. Waiting on the physical therapist and reading her history biography. Showing me what she learned in knitting class. And... meat with a little salad. That's her usual McAlister's meal. By now, I'm sure you've guessed we ended up taking it as a break week after all. Amber has been pushing through a lot of exhaustion plus some pain from her physical therapy. She is acutely feeling the loss of activities she once loved and is getting tired of people looking at her in pity. It all means she was becoming quite stressed and needed some time to truly rest and process her thoughts. 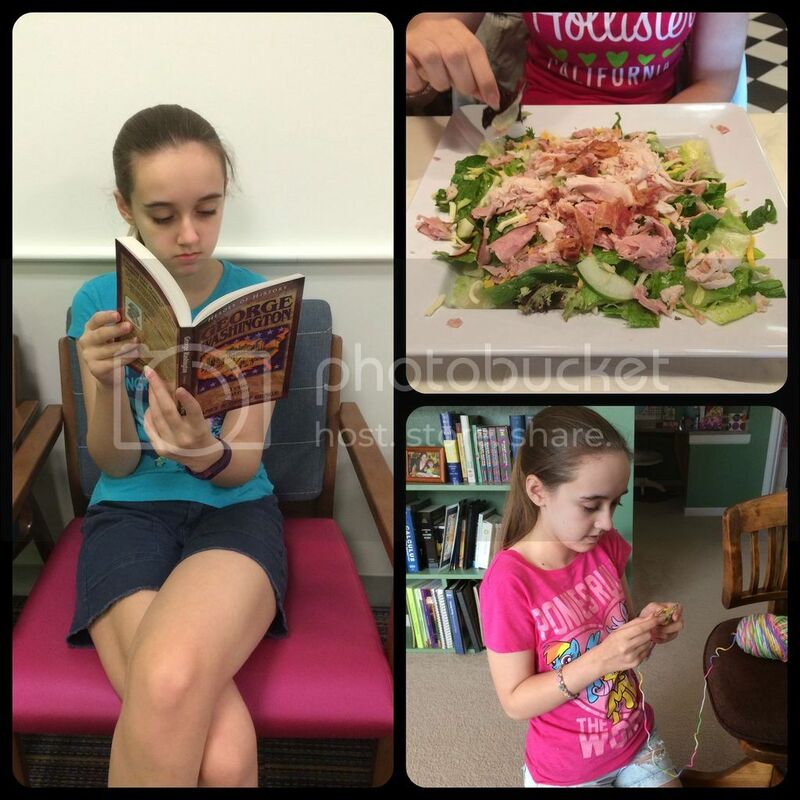 I had the school lessons for the entire week planned and entered into Homeschool Tracker. However after attending an exciting and tiring birthday party Monday afternoon, Amber was at the end of her reserves. We decided this week would be one of rest except for the few review items we are working with right now. The limited school work gave Amber a little direction when she felt listless, as well as assuaging her guilt over the extended unplanned break. Honestly I think our decision to leave breaks unscheduled is still for the best. Amber's body tells us when she needs them; not a calendar countdown. 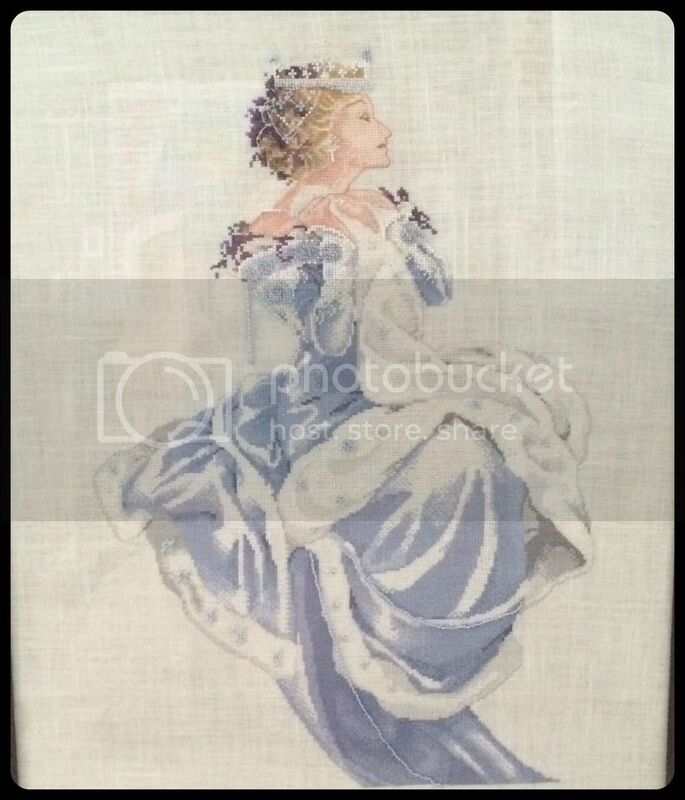 I finally finished the Winter Queen cross stitch project. Autumn Queen was finished several years ago and I'm already well into Spring Queen. I love to work on these projects, but sometimes life takes over and I have zero time. Physical therapy for EDS and learned how EDS is affecting more than just her joints. Daily therapy exercises at home. Confirmation: studying for her weekly tests. Daily flute practice and her regularly scheduled flute lesson. Drawing / doodling: Amber has discovered a love of drawing recently and has created rather intricate drawings as of late. Co-op classes: ancient history, economics, embroidery, and knitting. There was also lots of relaxing, including a new video game. Many of Amber's favorite online games have gone away, so we signed Amber up and installed LEGO Minifigures Online (LMO) on our computers. Amber adores playing and says it is a good deal like her dad's Warcraft in the game play except with nicer characters and more kid friendly. For the record, Amber does not play Warcraft at all, but has seen Fred play over the years. Playing LMO. 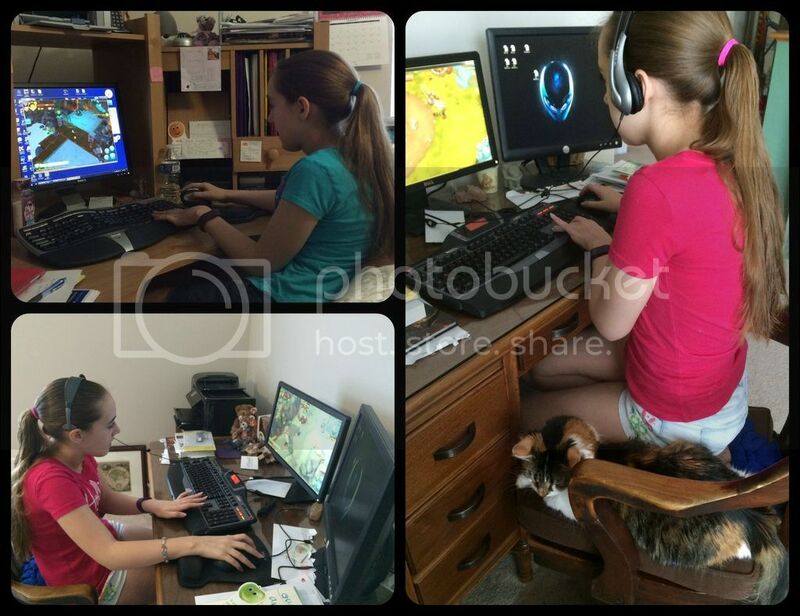 The bottom left picture is a little scary because she is sitting exactly like her dad, using his computer, playing a similar type of game. It's a mini-Fred. Amber spent a good deal of time playing LMO on Tuesday and again on Wednesday. Her computer is not happy running the game, but I think I've figured out that issue. It appears it has a memory chip going bad. Hopefully replacing that chip this weekend will have her computer up to the task of the game, but until then Fred and I are letting her borrow our computers to play. Amber did fall in love with my ergonomic split keyboard. After years of making fun of my long line of similar keyboards, Amber now wants one for herself. 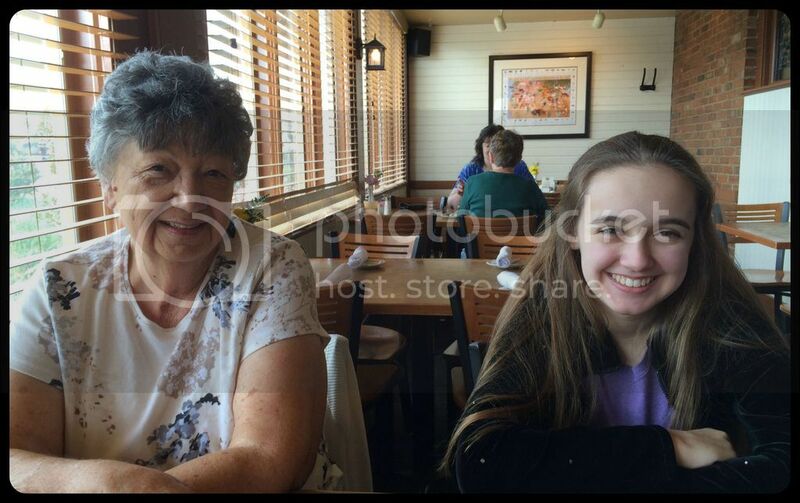 We ordered her a corded version of my wireless, which should be arriving sometime today. Lunch and shopping in the historic district this afternoon. Amber is exhausted now, but the weather was perfect for outdoor shopping and it was a good way to end our break week. We also test drove and purchased a wireless trackball mouse for Amber at a local store. With her EDS we decided Amber probably needed a mouse that was more comfortable to go along with the new keyboard. She liked the feel of the Logitech trackball, and has definitely found it easier to use than a laser mouse. I'm not a fan of trackballs, but her dad always has been. 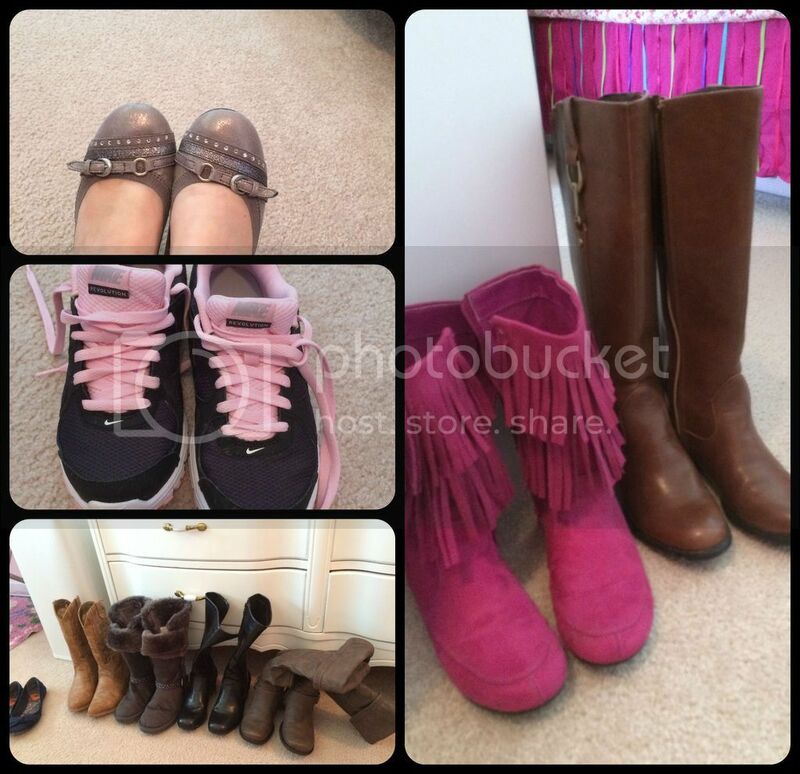 Finally, last weekend we began taking inventory of Amber's fall / winter clothes & shoes. None of the shoes fit Amber, again. Her feet are now noticeably larger than mine, which meant I inherited several pairs of barely worn shoes. In fact Amber's friend and I made out like bandits. Of course, then I ended up taking the child shopping for shoes we hope will fit for the next few months. But I was smart enough this time to encourage purchases suitable for me as well. Top left and Right are the shoes I managed to keep. The remainder (plus some not pictured) went to Amber's friend who's a few sizes behind. I really wanted to Nikes, since Amber had only worn them twice. But alas, it was not to be. Next week we are back to school while still trying to find a good schedule with physical therapy, water aerobics, confirmation, flute lessons, and co-op classes. We might need more breaks than anticipated. I am glad you both had a restful week. I know all about shoes that don't fit for long. Dean seems to grow out of shoes every few weeks right now. As for her shoes, that's a lot of pairs of shoes to outgrow! WoW! Glad her friend and you got to benefit from her stash of shoes though! Hoping she got some new shoes and clothes to make her smile! She does have a beautiful smile afterall! She did get some new things. After the great shoe clean out, she only had sandels left and Fall is knocking at our door. Visiting from Collage Friday... I'm going to check into that LMO game. My oldest would love that! We just got shoes for my 13 year old son, who is now taller than both Gary and I. He wears a size 9 1/2!! Oh my goodness, I remember giving birth to him like it was yesterday. Where did the time go?! These kids just keep growing! Amber is so happy to be taller than me. I really hope she doesn't pass Fred up though - he's 6'3". What a difference between Amber and Jerry! She feels guilty when not doing school even when she's not feeling well and Jerry is already asking when the next school holiday is!! We also have a track ball and I'm not very fond of it either!